It seems like every time I read this book, life gets in the way and I can't ever finish it as quickly as I'd like to. Seriously -- every time I make another trek to the Tower, I can almost count on life getting hectic while reading THE WASTE LANDS. I read THE GUNSLINGER in one day and THE DRAWING OF THE THREE in two days (and no, this isn't me bragging on my reading speed -- which is average -- but instead bragging on the awesomeness that is the DARK TOWER series), but it took me almost a week to finish THE WASTE LANDS. I am a full-time college student with finals fast approaching and this week I worked two jobs (I started a new job while working under a two-week notice at my old place of employment, only to quit the new job after two days and retract my notice), so I've been a bit busy. And I realize slowing down when reading a book is fine, but I get impatient with myself because I can't help but think of all the books on my TBR list I should be reading. I am a patient reader, but I like to plan out what I am going to read/when I am going to read it, and when I can't stick to that plan I get pretty annoyed. What bearing does this whining have on THE WASTE LANDS, the third novel in Stephen King's DARK TOWER series? Absolutely none, so let's get on with the review. What has always stood out to me about this book is how frenetic it is. Within the first twenty pages, Roland, Eddie, and Susannah get in a fight with a gigantic robot/bear named Shardik, and the action only picks up from there. In addition to Jake, the rest of the characters get some awesome character development in this volume. Eddie, while still being a lovable wise acre, matures a bit and slowly becomes a skilled gunslinger in his own right. Susannah merges her two personalities from the previous book into one strong mind-set, making her a great addition to Roland's ka-tet. And, of course, there's Roland -- in this book, he seems more human than ever before, all while being a cool, macho Clint Eastwood-type guy. Along with character development, King really excels at marrying horror and fantasy here. As I mentioned earlier, The Mansion is one of the creepier places he has created -- an abandoned place of terror opening into Roland's universe is genius, and the sequence involving the face in the wall is nothing short of thrilling. Other horrific things include The Tick-Tock Man and his henchman Gasher (what a piece of work he is! ), the waste lands, Lud, the bridge-crossing sequence, and, of course, Blaine the Mono, one of my very favorite supernatural villains ever. Seriously, he's right up there with Randall Flagg (who appears in a chill-inducing scene in one of the final chapters). Blaine stands out because he's not a typical villain. He's a machine, and he's not just scary -- he's also funny, and often he is both at the same time. I don't want to spoil it by talking about him too much, so that's all I will say on the matter. 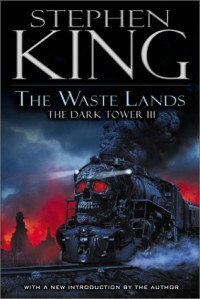 Perhaps the most intense and fast-moving book in the DARK TOWER series (SONG OF SUSANNAH aside), THE WASTE LANDS is a highlight in King's canon for the remarkable characters both large and small, the successful marriage of fantasy and horror and the sheer power of the story presented. There's not a word out of place -- it's one of those King books that gets everything right. At this time, I am taking a short break from DARK TOWER to focus on a few female authors I've been meaning to read but haven't yet. I'll probably start up again with WIZARD AND GLASS at the beginning of next month and go from there. I love most of the rest of the journey before me, but I highly doubt it will top the magnificence of THE WASTE LANDS.